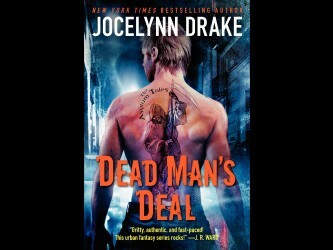 Dead Man’s Deal features Gage Powell, a wizard—no, a warlock. He explains, in snippets throughout the book, how he came to be the man he is and how he came to be where he is in life. When at an early age Gage shows signs of magical powers, he’s taken from his loving family. At the age of seven, Gage gets dropped into the cruel and torturous life of the Ivory Towers. There he is trained or battered into their way of thinking, along with all the arts of magic. Gage is a natural and learns quickly. Too quickly. He wants out and he must refrain from magic, a mandate when he has to turn his back on the evil Ivory Towers. The act of killing without reason was what turned him against the heart of their teaching. Gage is the first to ever escape and managed an agreement; he must live with no use of magic except for his own survival in a fight. It is the Towers’ newest form of torture. Smart and cunning, he makes a living as a tattoo artist. He makes a few close friends in a world from author Jocelynn Drake’s imagination. It is a world of exceptional beings; there are elves, pixies, a rouge guardian, trolls, and hobgoblins. He also has to deal with Tower assassins, jealous fae, and the surprise appearance of his long lost brother, just to name a few of his trials. The action is non-stop, just one thing crashing into Gage after another (his poor ribs can not take much more), never giving him time to think. You know life; always his responsibilities piled higher. Gage must deal with it all on his own. It is like a paradox; if one is left out, the whole line of straw will fail. Gage has been teaching himself magic during the years away from of the Towers. Now few know Gage, who he was, or what he is actually capable of. This too, he will put to use, as well as deadly force. Yes, the one thing he left the Towers for, he must do to win. Gage must kill. Gideon has been his connection to the Towers for the ten years he had been out. Now is when Gage realizes that he is more than a guardian. They have opened up to each other, revealing secrets that neither would want known. Gage’s brother, who he had not seen since he was seven, shows up in his life. His entrance opens the floodgate of trouble. It is at this point decisions must be made, frequent and fast. What Gage does will affect many, and possibly the world as he knows it. This may be the second in the series, but it works fine on its own. If you love Fantasy and Paranormal with magic revenge, this is your read. If you couldn’t tell, I loved it.